History-Learn about the history of rugs and where they were made! In the late 17th century many of the Pueblo Indians joined in with Navajo tribes in attempt to escape retaliation for the Pueblo Rebellion of 1680. It was the Pueblos that introduced sheep and weaving technology into Navajo culture. The tribes would harvest wool from churros (a small type of sheep with long, smooth wool) and weave blankets using mostly natural wool colors and few natural dyes such as red, yellow and green. Occasionally they would obtain indigo from mule trains traveling north from Mexico City. The oldest surviving remnants of Navajo rugs were found in a cave near Chinle, AZ where there was a brutal massacre in 1805. There are three different forms of Navajo blankets including Serape (a shoulder blanket that is longer than it is wide), saddle blankets (small and square) and Chiefs Blankets (a shoulder blanket that is wider than it is long). As a note, the term “Chiefs Blanket” is a misnomer because the Navajo social structure didn’t have chiefs. The style of the blankets evolved to be more complex and more colorful over time. The oldest blankets, from the classic period (1700-1850) had only wide bands of natural dark browns or blacks alternating with creamy natural white. Over the next 18 years they began to introduce shapes into the bands, first including one rectangle in each the top, middle and bottom bands, and the transitioning to use of the nine spot pattern which includes three (squares, rectangles or diamonds) in each the top, middle and bottom bands. In most recent period, the Regional Style Period (1930 – today), patterns have become much more colorful and complex. Trade of these blankets was far spreading. 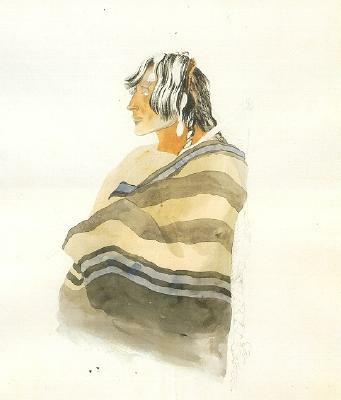 The first record of a Navajo blanket in Montana is a painting by Karl Bodmer, done in 1833 depicting a Piegan Blackfoot man wearing a first phase (classic period, 1700-1850) Chiefs Blanket. Today authentic Navajo blankets are a collector’s item, usually hung on walls. The oldest Navajo rugs available to collectors date back to the 1860s or 1870s, and a first phase Navajo Blanket can be worth more than half a million dollars.